Perinatal depression is a common disorder that has been associated with serious risks to mother and child. Recently, screening for depression in pregnant and postpartum women has increased, as has the development of new psychotherapy and non-drug treatment modalities. Matching patients to treatments can be challenging, and although research into personalized treatment of major depression in the general population has increased, no published guidelines focus on personalized treatment approaches to perinatal depression. In particular, guidelines on non-drug treatments are lacking. This review summarizes the evidence on personalized non-drug treatment of perinatal depression, how to incorporate patients’ preferences, novel treatments under investigation, and the potential role of biomarkers in matching patients to treatment. The review provides recommendations for future research in personalized care of perinatal depression. Recently, a personalized medicine approach to treatment of major depression in non-pregnant patients has been investigated and advocated,9 as factors such as patients’ preferences, clinical characteristics, and biomarkers have all been studied as predictors of response to treatment.910 Perinatal depression in particular needs an individualized approach to treatment, as research has shown that the disorder presents with heterogeneity of symptoms and phenotypes, including depression associated with severe anxiety or anhedonia.11 Whether the different phenotypes of perinatal depression correspond to differing genetic profiles or biomarkers remains to be understood. Although personalized treatment of non-perinatal depression has integrated recent research on biomarkers and genetics, especially in the choice of antidepressants,12 our understanding of the genetics and biomarkers of perinatal mood disorders is still in the early stages. Some of the most frequently implicated genes, including 5-HTT,13OXTR,14COMT,15MAOA,16 and HSD11B1,17 have been assessed in a recent systematic review.18 A large scale effort to decode the genetics of postpartum depression is under way,19 but results are not yet published. An effort to use genome-wide association techniques to identify genetic pathways that could be differentially regulated in postpartum depression, using a discovery cohort of 62 and a replication cohort of 24, identified 116 transcripts differentially expressed in pregnancy between women who developed postpartum depression and those who did not.20 These transcripts were related to pathways involving estrogen signaling, selenium and folic acid metabolism, focal adhesion, adipogenesis, and apoptosis. An alternative effort to use differential methylation to identify gene pathways involved in postpartum depression isolated two genes involved in estrogen receptor signaling whose methylation status may be predictive of the development of postpartum depression.21 A patent on the two biomarkers from this methylation study is pending,21 but none of the available information on the genetics of perinatal depression has yet been used for the prediction or treatment of perinatal depression in clinical settings. Thus, molecularly personalized perinatal depression treatment is still in its infancy, and this review will focus on the literature that will help to guide clinicians in their treatment choices, as specific patient populations may be more inclined to accept and/or benefit from certain treatments. Although drug treatment is often central to the perinatal depression treatment plan, perinatal patients often prefer non-drug treatment.2223 This review examines factors that influence the response to non-drug treatment in perinatal depression, focusing on how treatments may be tailored to subpopulations of patients with perinatal depression, including patients with gonadal hormone sensitivity, sleep disorders, attachment insecurity, personality disorders, social stressors, and trauma (fig 1). We searched PubMed, Google Scholar, and Cochrane Reviews from January 2000 to January 2018 using the following MeSH search terms: treatment preferences, personalized medicine, psychotherapy, sleep disorders, attachment, personality disorders, trauma, cognitive behavior therapy, interpersonal psychotherapy, mother-baby units, transcranial magnetic stimulation (TMS), genetics, and postpartum depression or perinatal depression. We prioritized randomized controlled trials (RCTs), meta-analyses, longitudinal observational studies, and cohort studies. We included all full text, English language, peer reviewed publications of acceptable size and quality, with thresholds for size and quality depending on the range of data published for the specific topic. When large randomized trials were available, we did not discuss smaller case series or studies without control groups. We discussed pilot and observational work when large, well structured studies were not available. We identified additional studies by a hand search of references from articles identified by the original search. This review summarizes the most clinically relevant treatment information from the literature on this topic. Perinatal depression is one of the most common morbidities of the perinatal period, affecting up to 14% of women in developed countries throughout pregnancy and up to a year after delivery,124 with approximately 19% of women having a depressive episode within the first three months post partum.1 The prevalence of perinatal depression is much higher in lower income and middle income countries, up to 20% on average.25 In the US, the prevalence of perinatal depression varies considerably across communities. Among 3952 Hispanic women interviewed in postpartum wards in Miami, New York, and San Francisco, 42.5% screened positive for depression.26 A sample of 192 inner city, financially impoverished African-American and European-American women found that 23.4% of women screened positive for postpartum depression,27 and 51% of a sample of 148 Hispanic and African-American pregnant women screened positive for depression28; of note, depression rates did not vary by ethnicity in either of these studies.2728 Social factors such as low social support, marital difficulties, negative life events, and intimate partner violence are known risk factors for depression in the perinatal period,29 which likely contribute to the variation in perinatal depression prevalence across different populations. These studies show that as the evidence accumulates for non-drug treatments for perinatal depression, patients’ preferences form a foundation for personalized treatment. Future research with large culturally and racially diverse populations is needed to improve understanding of patients’ preferences in choice of perinatal depression treatment. Although this review will focus on personalizing the available non-drug treatments for perinatal depression, it is important to recognize that some non-psychiatric illnesses can produce or masquerade as perinatal depression and a variety of psychiatric disorders can produce similar presentations. All women with suspected postpartum depression should be screened for thyroid dysfunction.35 Vitamin D deficiency has also been repeatedly associated with perinatal depression,363738 as has, to a lesser extent, anemia.39 Given the frequency of both conditions in the general population, they are worth investigating in women with perinatal depression, despite the absence thus far of formal recommendations. Rare obstetric complications such as pituitary infarction,40 as well as commonplace phenomena such as dysphoric milk ejection reflex, substance misuse, and flares of pre-existing autoimmune disease can also present with symptoms of depression.414243 Within psychiatry, care should be taken to disentangle unipolar depression from bipolar disorder, psychotic presentations, and postpartum flares of generalized anxiety and obsessive-compulsive disorder. Appropriate treatment selection begins, as always, with accurate diagnosis. The ability to personalize non-drug treatment depends in large part on the individual clinical characteristics of the patient. Selection of appropriate treatment depends on comprehensive review of the relevant medical, obstetric, psychiatric, social, and trauma history. 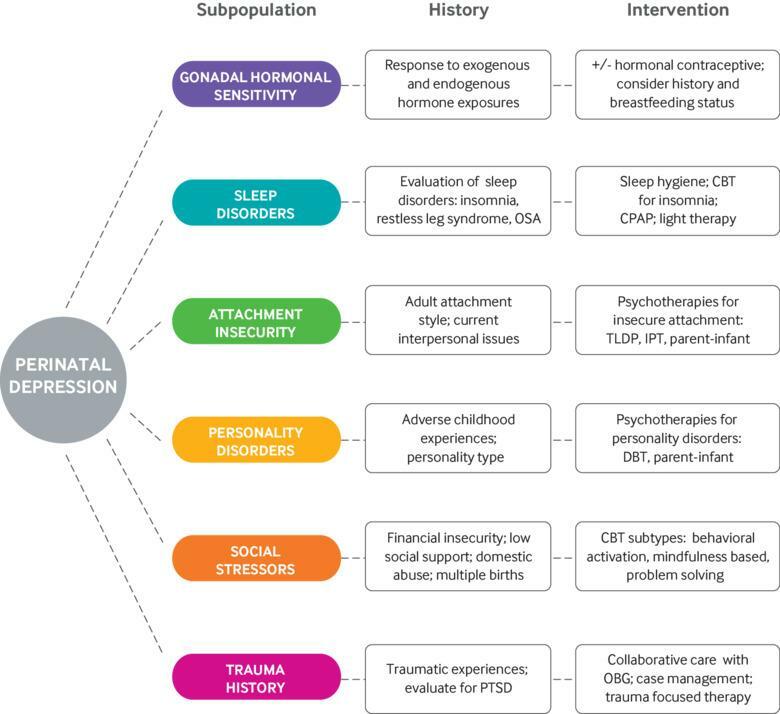 As detailed in figure 1, this review summarizes non-drug treatment options for subpopulations based on specific clinical characteristics, including women with gonadal hormonal sensitivity, sleep disorders, attachment insecurity, personality disorders, social stressors, and trauma. This review covers non-drug treatment, with particular focus on targeting psychotherapeutic approaches on the basis of clinical characteristics (table 1). Women with a history of gonadal hormonal sensitivity may be a subpopulation at risk for perinatal mood disorders. Such sensitivities likely apply to only a subset, with most women not manifesting any particular mood disruption in relation to gonadal hormone fluxes. Thus, studies of unselected populations are unlikely to identify these women or their unique needs. Previous experience of mood disruption in response to hormonal contraceptives may also be an important element of the history. Although most women do not have onset of psychiatric symptoms with modern contraceptives,61 whether women who have a history of mood disorder are more sensitive to oral contraceptives remains controversial, as some reviews have suggested an increased risk of mood destabilization whereas others have not.6162 A nationwide prospective study of 1 061 997 women found that oral contraceptive users had higher rates of first diagnosis of depression (rate ratio 1.1, 95% confidence interval 1.08 to 1.14) and antidepressant treatment (1.23, 1.22 to 1.25) compared with non-users63; consequently, psychiatric response to oral contraceptives should be considered in postpartum women who are starting to use them. The 2016 United States Medical Eligibility Criteria for Contraceptive Use recommendation is that women use progesterone-only contraceptives rather than combined progesterone and estrogen preparations in the early postpartum period of up to 42 days and consider duration post partum and breastfeeding status when changing to preparations containing estrogen.64 However, one double blind, placebo controlled RCT in 180 women found that long acting progestogen contraceptive given within the first 48 hours of birth, compared with placebo injection can lead to increased risk of depressive symptoms as measured by the EPDS at six weeks post partum (EPDS >11; relative risk 1.75, 1.12 to 2.72),65 which may suggest that psychiatric response to progesterone contraceptives should be taken into account in the early postpartum period. A “personalized” treatment approach to the group of reproductive hormone sensitive women with postpartum depression begins with a history of the woman’s previous response to endogenous and exogenous hormone exposure, including oral contraceptives, gonadotropin releasing hormone agonists, estrogen replacement therapy, follicular stimulating drugs, or progesterone supplementation, and careful consideration of the postpartum hormonal milieu. Women who are breast feeding will have a unique reproductive hormone state of chronically low estrogen and progesterone without variation. No studies have examined the effect of PMDD on psychiatric response to this hormonal state of breast feeding, but we could hypothesize that this absence of cyclical variation is favorable for these women, as women with PMDD report improved symptoms at other times of cycle cessation, such as after administration of gonadotropin releasing hormone agonist and with administration of extended cycle hormonal contraceptives.6667 Destabilization of mood may occur when menses resume; as this would be a time of increased risk for relapse, higher doses of antidepressant may be needed at that time. For other women, however, the low estrogen and progesterone state may not be favorable, and this potential phenotype should be considered in the differential diagnosis of treatment resistant perinatal depression. If the depression is severe, treatment resistant, and associated with suicidality, personalized treatment may include consideration of a shortened period of breast feeding and return to previous oral contraception if that was associated with mood stability. Despite intense interest in past decades in the use of exogenous estrogen for the treatment of postpartum depression, evidence for the utility of this treatment is promising but remains preliminary,65 and it has not been widely adopted in clinical practice. Exogenous estrogen can interfere with lactation,68 which may represent a barrier to its adoption among breastfeeding women. Although widespread sampling of pregnant women for allopregnanolone concentrations is not indicated at this time, these recent findings from biomarker research and RCTs offer a novel potential personalized treatment for women with severe major depression resistant to conventional psychotherapeutic and psychopharmacologic modalities. This intervention is likely to be most appropriate for women with very severe postpartum depression as well as excellent social supports for infant care, as the drug is delivered by intravenous infusion and requires a hospital stay. Despite the increased prevalence of OSA in perinatal patients, the prevalence of major depression in this specific subpopulation of sleep disordered perinatal patients remains unclear. To date, no studies of the efficacy of CPAP for comorbid depression in pregnant and postpartum patients have been conducted. Nevertheless, CPAP is indicated when OSA complicates pregnancy,73 and oral appliances for sleep apnea in pregnancy are under study as well (clinicaltrials.gov, NCT03646214 and NCT03138291). Consequently, a personalized treatment approach to treatment of perinatal depression in this population involves coordinated care with a sleep specialist to maximize adherence to and effectiveness of CPAP intervention. Insomnia unrelated to OSA is also a risk factor for and a consequence of perinatal depression.73 Recent studies have also shown that poor sleep quality may be an independent risk factor for suicidal ideation among pregnant women.72 Women with documented sleep phase disorders, or with histories of seasonal affective disorder, constitute special populations who may find particular benefit from sleep based interventions. Postpartum weight retention has been associated with reduced sleep efficiency,77 suggesting that women with increased body mass or difficulty shedding pregnancy weight could also constitute a specific population of interest with respect to sleep based interventions. Light therapy is also an important tool in promoting circadian eurhythmia and may be of particular importance in women who report worsening of mood in the winter months. Bright light therapy has shown superiority to dim light placebo for antenatal depression (remission attained by 68.6% v 36.4%, respectively, as measured by the final HAM-D score after a five week treatment course; P<0.05).87 However, the only RCT for postpartum depression found no difference between women receiving light therapy and controls.88 This might be related to the significantly greater environmental circadian disruption induced by the need for overnight newborn care, which could potentially overwhelm any effect of light exposure. An interesting recent advance in this area involves the use of home-wearable light devices, which reduce the burden of treatment associated with a stationary light box. Acceptability of a wearable light therapy device in postpartum women has been demonstrated,89 and a larger randomized trial is ongoing (clinicaltrials.gov, NCT02769858). Personality disorders, which are also related to adverse experiences in childhood,33 have been less well studied in this population; nevertheless, available evidence indicates that pre-existing personality disorders may also represent risk factors for both anxiety and depression in pregnancy.99 In a sample of 34 women with depressive symptoms assessed with the EPDS at six weeks and one year post partum, those with postpartum depression persisting at one year (EPDS score >12) were significantly more likely to have an axis II disorder (odds ratio 21.1, 1.49 to 2.47; P=0.02).100 Mothers with strong borderline and narcissistic traits or disorders often have difficulty with effective parenting, and studies suggest that their dysregulation of affect and difficulty with empathy and mentalizing may all have negative effects on child development.101 In a recent study, borderline personality disorder was found to be an independent risk factor for negative effects of perinatal depression on child development.102 Women with borderline personality disorder are also at increased risk for an array of adverse obstetric outcomes,103 including gestational diabetes (odds ratio 1.45, 1.13 to 1.85), premature rupture of membranes (1.40, 1.07 to 1.83), chorioamnionitis (1.65, 1.14 to 2.39), venous thromboembolism (2.11, 1.12 to 3.96), cesarean delivery (1.44, 1.26 to 1.64), and preterm birth (1.54, 1.29 to 1.83), emphasizing the importance of identifying and treating borderline personality disorder in pregnant women. To date, no studies have identified the role of personality disorders in response to psychopharmacologic or psychotherapeutic interventions for perinatal depression. Given that personality disorders are known to be associated with resistance to treatment in non-depressed patients,104105 this is an important area of future research. A personalized approach to the patient with comorbid personality disorder and perinatal depression would include evidence based treatments for the personality disorder. For instance, in perinatal patients with borderline personality disorder, a dialectical behavioral therapy intervention should be considered, as this has been shown to be effective in reducing symptoms in patients with borderline personality disorder. Attachment therapies have been recommended, which include individual dynamically oriented psychotherapy focused on maternal childhood attachments and the association of maternal experiences with attachment figures to the current role as a mother.101 RCTs are needed to compare outcomes of mood and parenting in perinatal patients with personality disorder. Parent-infant psychotherapy is another attachment oriented psychotherapy that represents an important personalized approach to treatment in patients with comorbid borderline personality disorder and perinatal depression. Parent-infant therapy addresses the difficulty that borderline and narcissistic patients have with mentalization of their infants. A promising method of parent-infant therapy is the watch, wait, and wonder method,106 which teaches mothers to observe and understand their infants’ communication efforts and internal states. A case study of six mothers with borderline personality disorder describes successful implementation of this method,107 but no RCTs have looked at whether adjunctive attachment oriented psychotherapies enhance treatment for perinatal depression with comorbid personality disorders. CBT is a structured form of psychotherapy that focuses on identification and modification of negative or dysfunctional thought patterns and may be a particularly helpful intervention for women with significant social stressors. Its efficacy for both prevention and treatment of perinatal depression has been established in more than 40 RCTs, which have been assessed in multiple meta-analytic reviews.744114115 Subgenres of CBT that have been tested in perinatal populations include behavioral activation,116 mindfulness based cognitive therapy,117 and problem solving therapy.118 Common modifications for the perinatal population include the addition of peer support,119 partner involvement,120 and parenting education,121 all additions that may be helpful personalized psychotherapy interventions for women with social stressors. The most recent meta-analysis of trials of CBT for perinatal women assessed which characteristics of the interventions might be associated with greatest benefit.44 It suggested that individual therapy might be associated with greater reductions in depressive symptoms than group therapy, and interventions targeted to later stages of pregnancy or the postpartum period were often more effective than those started earlier in pregnancy. Certain characteristics of patients such as single motherhood and minority race were associated with greater benefit from the intervention. PTSD is especially common in the perinatal period in high risk groups. In a systematic review and meta-analysis, the prevalence of PTSD in pregnancy was 34.4% for women with a history of childhood trauma and maltreatment.122 Recent studies have shown a high comorbidity between PTSD and perinatal depression in women with a history of trauma,123124 similar to the high comorbidity findings in the general population.125 Most studies of psychopharmacology and psychotherapy for perinatal treatment have not included patients with comorbid PTSD, and research is needed on providing effective treatment for perinatal depression with comorbid PTSD. One promising personalized approach to perinatal depression with comorbid PTSD is the MOMCare collaborative care intervention, which includes medication management in collaboration with the patient’s obstetrician/gynecologist; telephone and in-person delivery of brief interpersonal psychotherapy; case management and problem solving for basic needs such food, housing, and job training; and active outreach after missed sessions.126 This collaborative care model used an active stepped care approach, and patients who had less than 50% improvement in depressive symptoms by six to eight weeks received augmentation of interpersonal psychotherapy with drugs or increased dosage of drugs. A randomized study compared MOMCare treatment for 18 months of extended follow-up with maternity support services, which included referral to obstetrics and gynecology for psychopharmacologic intervention or outside services.126 For women with comorbid PTSD and perinatal depression, the MOMCare program (n=48), versus control (n=58), was associated with significant improvement in severity of depression (Wald c2=8.51; P<0.05), depression response (Wald c2=4.13; P<0.4), and remission (Wald c2=8.07; P<0.02).126 Women without comorbid PTSD experienced similar declines in depression severity, regardless of treatment group (Wald c2=0.01; P=0.90). When recommending psychotherapy for perinatal depression, recent research on response to psychotherapy has shown the importance of considering patients’ characteristics, such as attachment style, personality factors, social stressors and supports, and trauma history (table 1). Choice of psychotherapy in perinatal patients should evaluate and weigh the salience of specific symptoms and interpersonal factors. Not all psychotherapies will be effective for every patient. For instance, patients with comorbid anxiety disorders in general population studies were found to have decreased treatment response with interpersonal psychotherapy138; consequently, these patients may best be treated with CBT tailored to treatment of anxiety as well as depression. PTSD has been found to be an important subpopulation in perinatal depression, and perinatal depression with comorbid PTSD may benefit from personalized treatments such as interpersonal psychotherapy.126 Additionally, women with bipolar disorder constitute a group at uniquely elevated risk for postpartum mood disorders,139 and whereas the mainstay of treatment for bipolar disorder consists of drugs, interpersonal and social rhythm therapy may be helpful adjuncts.140 No published studies have evaluated the utility of this therapy in pregnant women, but a randomized trial is in progress (clinicaltrials.gov, NCT02402738). Future studies of perinatal depression should identify subpopulations and comorbid disorders and evaluate whether interventions used for these disorders in non-pregnant patients enhance the effectiveness of treatment in the perinatal population. Group support interventions may be particularly helpful for perinatal depression. A recent meta-analysis of seven RCTs involving 869 participants on group support for postpartum depression determined that this type of intervention was more effective than treatment as usual, with a pooled standardized mean difference of –0.59 (–0.98 to –0.21; P=0.002). Among seven RCTs with 301 participants, peer support and group CBT were comparable in effect size, with a pooled standardized mean difference of 0.10 (–0.20 to 0.39; P=0.53).141 These interventions may help to overcome challenges that are common to postpartum women, including infants’ sleep and feeding routines, marital and family relationships, and general household disruption. Traditional psychotherapeutic treatments are time intensive, labor intensive, and expensive, requiring many hours of one-on-one attention from a trained specialist. Cost and time are common barriers to engaging in therapy, and even more so for women who are primary care givers for infants or young children. In recognition of this, interest in developing technology assisted methods for delivering the benefits of psychotherapy to perinatal women while mitigating problems of cost, time, and travel is growing. Involvement of trained therapists in remote format therapy span a range from those that are entirely automated to remote delivery of traditional one-on-one therapy. In between are formats that combine automated provision of information or techniques with a variable amount of therapist and/or peer support. Automated formats are most adaptable to highly structured and manualized therapies. Remote provision of traditional individual psychotherapy can be adapted to most therapeutic modalities but does not provide appreciable improvements in cost or temporal flexibility over face-to-face encounters. However, remote interventions can save the patient substantial time in travel to the therapist’s office and provide the benefit of not having to leave young infants at home or take them out in public. In one of the earliest published internet based interventions, an RCT randomly assigned 910 women with postpartum depression (EPDS >12) to an internet delivered behavioral activation program for postnatal depression versus treatment as usual.116 The intervention involved the delivery of 11 weekly sessions that included an educational multimedia presentation and a homework exercise and offered access to an online chat room for peer support. Although only 38% (343/910) of participants completed the 15 week outcome assessment, fewer women in the intervention group continued to exceed the depression score cut-off (66/181) compared with treatment as usual (91/162). This study was limited by high attrition rates but suggested that these types of interventions could offer benefit, although further research is needed. A recent meta-analysis of therapist supported, internet based CBT for postpartum women identified eight RCTs in this population.53 Interventions ranged from six to 12 sessions and combined classical CBT approaches such as cognitive restructuring and behavioral activation with elements of psychoeducation, parenting preparation, and parenting focus that were specific to the postpartum period. All studies showed significant improvements over controls receiving treatment as usual in symptoms of stress (d=0.84; five studies), anxiety (d=0.36; six studies), and depression (d=0.63; eight studies). No study included a comparison with classical face-to-face CBT, but effect sizes for such interventions have been found to be in a similar range.44 The authors noted that attrition was greater in interventions that combined self help with limited therapist support, compared with those with exclusive therapist support. A previous meta-analysis analyzed 11 trials of computer based CBT for perinatal women more broadly.143 In this analysis, effect sizes were smaller and results more mixed, particularly for stress and anxiety symptoms, although overall most studies showed some benefit, and results for depressive symptoms were robust. Interventions intended to address existing mental health concerns were more effective than preventive approaches. Recruitment for these studies relied almost entirely on media advertisements and self referrals, so the results may not apply equally to clinical populations. Nevertheless, they are encouraging in their potential to reach women who may not come to clinical attention. Interpersonal psychotherapy is less structured than CBT and thus does not lend itself to computer based approaches. However, remote delivery of individual psychotherapy has the potential to be more accessible to women who are tasked with the constant and temporally inflexible demands of a newborn. A single prospective cohort study of telephone based interpersonal psychotherapy for postpartum depression has been published.54 Therapists were certified nurse midwives who received 16 hours of therapy training but otherwise had no previous training or experience as psychotherapists. For participants who received the intervention of eight 50 minute sessions (n=41), the HAM-D score at eight and 12 weeks was significantly lower compared with controls (P=0.047 at week 8; P=0.029 at week 12). Women in the intervention group found the intervention highly acceptable and more accessible than traditional face-to-face psychotherapy; however, five out of eight therapists dropped out of the trial, suggesting that attrition may be high among non-specialists providing psychotherapy. Among the 20 control women referred to usual care, only 10 actually obtained any mental healthcare. This is quite typical and underlines the point that remotely delivered therapies often represent a feasible alternative, not to appropriately delivered in-person mental healthcare, but to no care at all. An ongoing RCT of telephone based interpersonal psychotherapy provided by trained nurses to 240 postpartum women has also presented positive initial results in abstract form,55 although publication of final results is still pending. Because pregnant women constitute a vulnerable population and are thus not usually appropriate participants for trials of new drugs, most of the treatments available in this field have been piloted for safety and efficacy in the general population first. The notable exception to this is brexanolone, discussed in the section above on gonadal hormonal sensitivity, development of which arose from basic research implicating allopregnanolone in postpartum depression. Other than this intervention, in the future it will be important to look at two specific populations of perinatal women that are currently underserved: the large pool of women with mild to moderate illness who go undiagnosed and untreated, and the much smaller but more seriously impaired pool of women who have severe illness that does not respond to first line treatments. Treatments that hold promise for a broader reach among women who would otherwise have gone undiagnosed and untreated include the variety of technology assisted psychotherapies discussed above. These range from remote delivery of classical individual psychotherapy to app based interventions with the capacity to reach unlimited numbers of women. Remotely delivered psychotherapies have the potential to provide flexibly available mental healthcare that can be accessed around the needs of a newborn and to reach women who otherwise would not come to mental health treatment owing to problems of stigma, accessibility, or cost. Although most studies have been conducted in non-clinical populations, the available evidence suggests that most remotely delivered therapies are superior to treatment as usual. Future studies in perinatal depression should investigate whether these novel psychotherapies increase engagement in therapy and represent a personalized approach to psychotherapy that is effective. Much work remains to be done to document the efficacy and applicability of each of these interventions, but as a whole they hold great promise for addressing the enormous problem of underidentification and undertreatment of perinatal mood disruption. Treatments that hold promise for women in the severe or treatment resistant category include the establishment of specialized perinatal units and mother-baby units. Women with severe perinatal mental illness may need to be admitted to hospital to achieve stability in a safe environment. Specialized perinatal units have been an important treatment option for women in other nations for many years,144145 and they are now being offered in the US.146147 Established across countries in Europe, psychiatric mother-baby units allow for infants to remain on the psychiatric unit with their mother 24 hours a day.144145 Such units have not been possible in the US owing to the healthcare system that does not support neonatal or pediatric care in the psychiatry unit; however, specialized perinatal units have been established that allow for infants to be on the unit for extended hours during the day.147 These inpatient perinatal units offer specialized care with particular attention to maternal-infant attachment. An additional treatment that is established in the general population with major depression and that also has potential for use in perinatal women is TMS, which is approved by the US Food and Drug Administration for patients who have failed to respond to at least one antidepressant. TMS is particularly relevant to the pregnant population because it has the potential to avoid pharmacologic effects on the fetus, and it is significantly less invasive than the other available neurostimulatory approaches such as electroconvulsive therapy and vagal nerve stimulation. Two open label pilot studies of TMS for pregnant women have been reported.148149 Among 10 women with major depressive disorder in the second or third trimester who received 20 sessions of 1 Hz TMS at 100% motor threshold to the right dorsolateral prefrontal cortex, seven women responded to treatment, defined as greater than 50% reduction in HAM-D score.148 In a second pilot study of 30 women with depression in pregnancy, patients received 18 sessions of 25 Hz TMS at 100% motor threshold to the left dorsolateral prefrontal cortex, and approximately 40% of participants had greater than 50% reduction in HAM-D score; in both of these studies, the procedure was generally well tolerated, most women achieved some response, and approximately one third achieved remission. No adverse pregnancy or fetal outcomes were reported in either study. Overall, TMS is a viable option for pregnant or postpartum patients with depression. Its clinical efficacy is comparable to that of drugs,156 while avoiding their systemic effects. Although it would be optimal to have more data on TMS for pregnant patients, and specifically on long term developmental outcomes, the available information at least suggests that the procedure is generally well tolerated. From a safety perspective, TMS is a reasonable choice, although it should be understood that TMS is not likely to represent a panacea. One major drawback is the frequency of treatment needed (typically daily for a period of many weeks), which would likely prove a significant barrier to women with childcare responsibilities. Thirty six trials are listed on clinicaltrials.gov under the heading of perinatal depression and treatment. Several recently completed or ongoing (result reporting dates pending) studies include innovative models of care delivery focused on breaking down barriers to care, such as virtual treatments with video conference visits with patients staying within their own home (clinicaltrials.gov, NCT03291600; estimated completion date March 2019). Multiple studies are investigating novel alterations of standard, evidence based psychotherapy treatments, such as enhancement of interpersonal psychotherapy with interpersonal psychotherapy with the mother-infant dyad (NCT03499756; completed January 2017) or couples (NCT03499756, estimated completion date December 2020). Sleep interventions are another area of focus in emerging treatment trials, and studies include bright light therapy (NCT02053649; estimated completion date February 2018; NCT02664467; estimated completion date November 2019) and positive airway pressure for depressed pregnant women with disordered breathing (NCT02507297; estimated completion date June 2020). In terms of diagnosing perinatal depression, the US Preventive Services Task Force, American College of Obstetricians and Gynecologists, and American Academy of Pediatrics recommend screening with a validated tool such as the EPDS during pregnancy and postpartum.34 Although screening is recommended, universal screening is not a required component of standard care. Furthermore, in practice, a single screening is not sufficient to identify women with perinatal depression, as depression can occur at any time during the pregnancy and postpartum. Most guidelines on the treatment of perinatal depression focus on drug treatment. To date, few published guidelines cover non-drug treatment approaches to perinatal depression. A recent international analysis of clinical practice guidelines for treatment of perinatal depression found that among 16 international guidelines, most guidelines, including the American Psychiatric Association (US), Centre of Perinatal Excellence (Australia), and National Institute for Health and Care Excellence (UK), agree that psychotherapy, and in particular CBT, should be used as initial treatment in mild to moderate depression during pregnancy.157 Most guidelines indicate that an approach focused on antidepressant drug treatment should be used in severe depression in pregnancy.157 Only the American College of Obstetricians and Gynecologists determined that antidepressants should be used as initial treatment instead of psychotherapy during pregnancy, independent of severity of depression. In the postpartum period, most guidelines agree that psychotherapy should be the initial treatment for mild to moderate depression, with consideration of antidepressants as initial treatment for severe depression, and most encourage continued breast feeding, independent of the type of antidepressant drug.157 Of note, these guidelines favor a personalized approach to treatment, based on detailed history that allows for identification of clinical characteristics to guide individualized treatment. A major limitation to our understanding of how best to personalize treatment for perinatal mood disorders is our incomplete understanding of the basic biologic mechanisms for mood disruption associated with gonadal steroids. Although the recent identification of cellular mechanisms such as expression of the estrogen effector complex ESC/E(Z) represents an important forward stride,58 our understanding of this area remains limited. Future work in this area will be important to establish some means beyond clinical history of identifying women at risk for mood disruption in relation to alterations in reproductive hormone concentrations. Another area in which our understanding remains limited is in the conception of the genetic and epigenetic factors that shape mood response in the perinatal period. Although genetic personalization of drug therapies is an established reality in many areas of medicine, the field of perinatal psychiatry is still at the stage of attempting to identify potentially relevant genes and their associated molecular pathways. Much work remains to be done to form a molecularly based understanding of perinatal mood disruption that would be sufficient to inform selection of patients or treatment alternatives. The absence of specific investigation of personality disorders and history of early life adversity with respect to psychotherapeutic interventions in postpartum women is also an important limitation of our current state of knowledge. A history of early life adversity clearly contributes to risk for perinatal mood disruption, and personality disorders are independent risk factors for negative effects of perinatal depression on child development, but current recommendations for treatment approaches in women with these risk factors have largely been drawn from work in non-perinatal populations. Studies specifically designed to investigate the unique needs of perinatal women would be a welcome and important guide for clinicians working in this field. Perinatal depression is a heterogeneous disorder that may result from a wide variety of medical, social, and psychiatric impairments. Although psychopharmacologic interventions are an important aspect of treatment, non-drug interventions also play a key role in this population and importantly are preferred by pregnant and postpartum women owing to concerns about transplacental and lactational transfer of drugs. Appropriate non-drug interventions include sleep management, group support, individual therapy, remote and computer assisted interventions, and more intensive interventions such as transcranial magnetic stimulation for pregnant women and specialized mother-baby units for postpartum women. Decisions about how to determine which of these would be most beneficial for a given woman will depend on the particular nexus of psychiatric, psychosocial, and medical factors that contribute to her illness, as well as on her own expressed preferences. More research is needed on personalized treatment approaches to help to match patients to treatments. Future studies should focus on clinical factors involved in response to traditional and novel psychotherapies, potential biomarkers for treatment choices, and treatment options for treatment resistant patients. We interviewed patients who presented for consultation and treatment of perinatal depression during the writing of this review. We did not do formal interviews with patients, and patients did not view or edit the content of the manuscript. The goal of these interviews was to evaluate patients’ preferences for information on non-drug interventions in the treatment of perinatal depression. Patients expressed desire to understand which non-drug interventions, including psychotherapy and non-psychotropic drug interventions, were most likely to help perinatal depression; the differences between types of psychotherapy; and which non-drug therapies best matched their symptom profile. Contributors: SLJ, TKR, KEW, and NLR contributed equally to this work in terms of research, writing, generation of figures and tables, and revisions to the manuscript. PPD ACT. Postpartum Depression: Action Towards Causes and Treatment. 2017. http://www.pactforthecure.com/.
. A challenge for perinatal psychiatry: therapeutic management of maternal borderline personality disorder and their very young infants. Clin Neuropsychiatry2005;2:302-14. Research on Expecting moms and Sleep Therapy (REST) Study. Research on Expecting Moms and Sleep Therapy (REST). 2016. https://rest.ucsf.edu/.
. Psychotherapy in a new key.Basic Books, 1984.
. Changes in clients’ attachment styles over the course of time-limited dynamic psychotherapy. Psychotherapy2001;38:149-59doi:10.1037/0033-3204.38.2.149 .
. Watch, Wait, and Wonder: Testing the Effectiveness of a New Approach to Mother-Infant Psychotherapy. Infant Ment Health J1999;20:429-51doi:10.1002/(SICI)1097-0355(199924)20:4<429::AID-IMHJ5>3.0.CO;2-Q .
. Mellow Babies: A group intervention for infants and mothers experiencing postnatal depression. Couns Psychol Rev2010;25:28-40.
. Psychiatric services for women following child-birth. Int Rev Psychiatry1996;8:87-98doi:10.3109/09540269609037821 . Yanamadala J, et al. Estimates of peak electric fields induced by Transcranial magnetic stimulation in pregnant women as patients using an FEM full-body model. 39th Annual International Conference of the IEEE Engineering in Medicine and Biology Society 2017:1441-4.